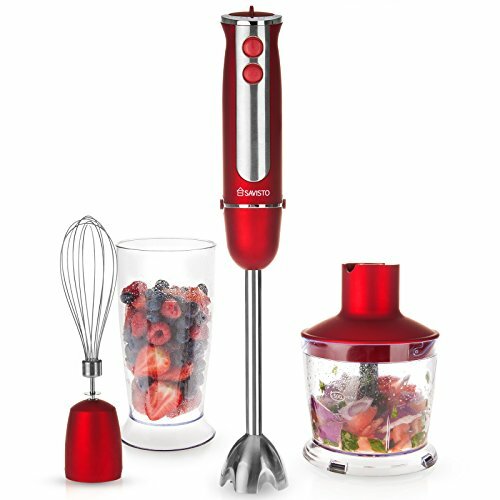 Featuring an ergonomic, rubberised grip, you’ll notice that Savisto’s hand blender is comfortable and easy to use. It’s also compact for easy storage, and its various accessories are fully detachable and dishwasher safe, ensuring easy clean-up when you’re finished with them. Whisk – The wire strands will spin around causing your mixture to be beaten. This will cause your mixture to become smooth, it’s also used to get air into your mix to help it rise during cooking. It’s commonly used with eggs, cream, batter or cake mixes. Food Processor – Used with heavier tougher ingredients. You’ll find blades within the container, these will spin round causing your ingredients to become chopped, pulverized, mashed and sliced. Strengthened stainless steel blades can dice even the most stubborn root vegetable to pieces in no time – and the variable speed settings and handy turbo power button are included to ensure that even if your blades aren’t doing the job at the moment, they soon can be! Despite its powerful 750 watt DC motor, Savisto’s food processor is an extremely quiet kitchen product; even when turbo mode is activated, you’ll barely notice it’s switched on, setting it apart from other food processors which can be noisy and irritating to use. A great gadget and very useful! I bought myself this as a little present and I’m wondering how on earth I managed in the kitchen without one. I like to cook a wide range of meals and preparation did always seem to take much longer than it should. Using this hand blender has seriously reduced how long it takes me to prepare ingredients, what was taking 5 minutes now takes seconds! Just excellent! Excellent quality. User-friendly and very beautiful blender. I want to buy something else from this manufacturer.